Laing House is inviting Halifax to watch movies, have some chats and end misconceptions about mental illness. 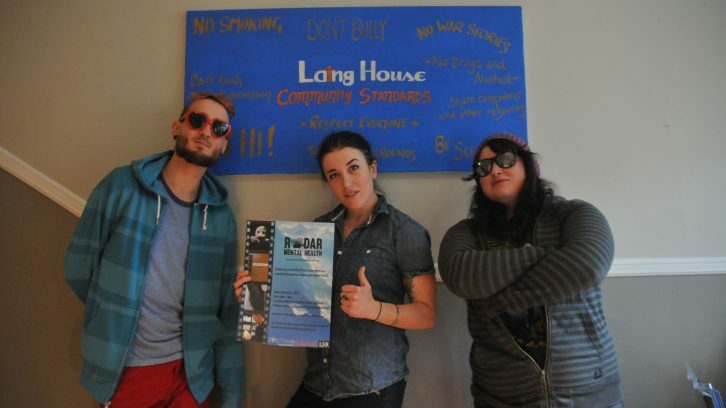 Laing House is a drop-in, peer support organization on Barrington Street for people aged 16-29 who have a mental illness. It’s been running since 2001 and offers members a safe space to get advice, participate in monthly activities or to hang out with new and old friends. On Thursday, Feb. 2, they’ll be screening four short films about mental health. The works are directed, written, filmed and edited by group members. The films cover different topics that range from the negative side effects of psychiatric medication to fake ‘masks’ that people create when they have a mental illness. Kelly-Wolfe said the best part of working on these films was learning how to use a camera. Many of the members who worked on the films learned how to shoot and edit videos at Laing House. Stephanie Young, a filmmaker and community support worker for the organization, has been mentoring and helping members create films for the past two years. Young and Kelly-Wolfe agree that creating these films have brought the group closer together. But Laing House is a community; even people who haven’t worked on the videos are excited for the screening. Young graduated from NSCAD University and has a background in filmmaking, but she wasn’t always a film mentor. She got involved with Recovery Advocacy Documentary Action Research (RADAR). RADAR an organization that creates videos about mental illness. The group is made up of academics and filmmakers from Toronto, Montreal and Halifax. They want to teach young people who have a mental illness how to create and share their own stories. The film organization partnered with Laing House to create the film screening and panel discussion. Dr. Rob Whitley is a professor of Psychiatry at McGill University and founder of RADAR. He received a grant in 2014 from the Canadian government to create the group, but he’s been making his own mental health videos since 2011. He’s hoping video screenings, such as this one, will help end stereotypes about people with mental illness. RADAR has had a public screenings in both Montreal and Toronto. This will be the first one in Halifax. The event is scheduled to take place from 6-8 p.m. at the Halifax Central Library on Spring Garden Road. After the screening there will be a panel discussion about mental illness, stigma and the filming process.